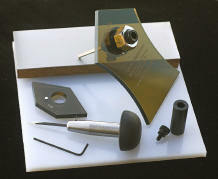 Engraving Tools, Stone Setting Tools for Jewelers, Metal artists, Guns, Knives and Jewelry Engrave. TIP: Swipe your mouse left and right while clicking on the above photos to scroll through and interact with them. 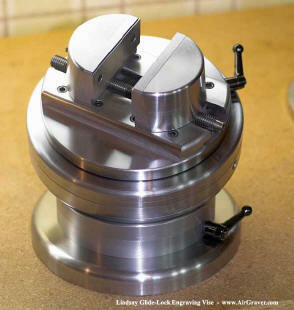 The AirGraver® is a self-running, miniature air engine tool using no springs or electricity. Just blowing in the handpiece will cause it to run. As this is impractical, the handpiece utilizes one of two types of controllers. 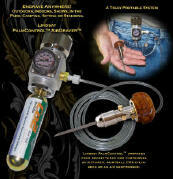 One controller is a set of regulators that attaches to an air compressor and a foot pedal. 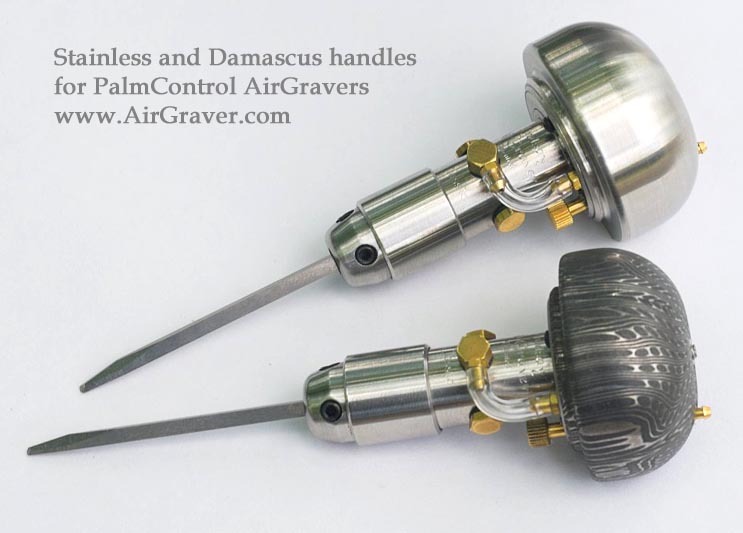 The second option is a PalmControl® handle that automatically uses the natural palm pressure of the user on the entire handle to control and vary the power of the tool. Even if a person is accustomed to foot pedal engraving, a few minutes with the PalmControl® is all it takes to realize the improved responsiveness. 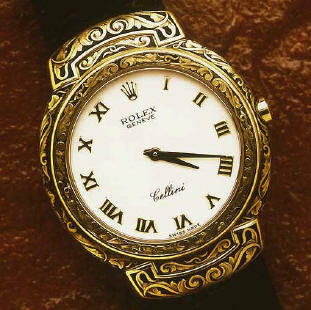 The hand is more sensitive than the foot and capable of subtle corrections. Because the tool is self-contained, there is no constant background noise or vibration from a separate power unit. 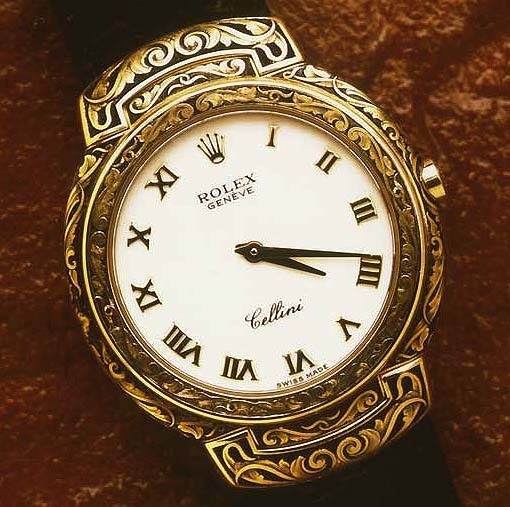 Most professional engraving artists and jewelers could probably engrave with any tool and turn out nice work given enough time, however tools with improved design help make the hand engraving process easier and quicker. 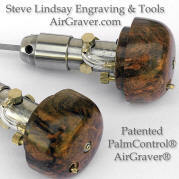 The AirGraver® is the most advanced system for intuitive ease of use for the professional or beginning engraver. 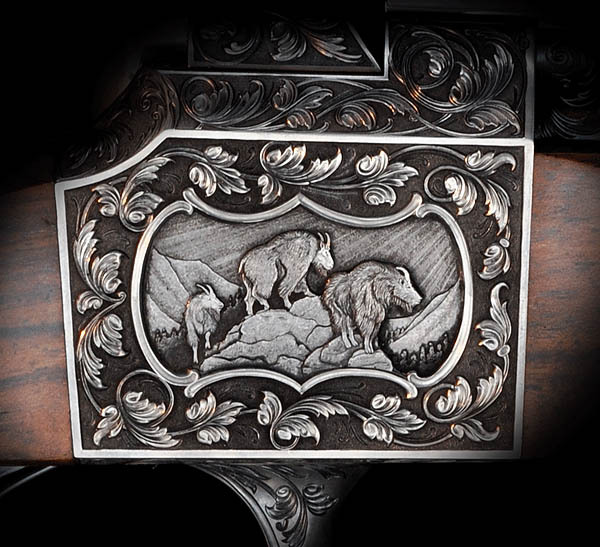 To discover the difference, enroll, support and learn engraving from hand engraving centers and schools where all equipment on the market is made available for students to work with. The staff and instructors of these schools are not paid to sell equipment and therefore are unbiased. They are willing to allow students to decide for themselves what works best for them. 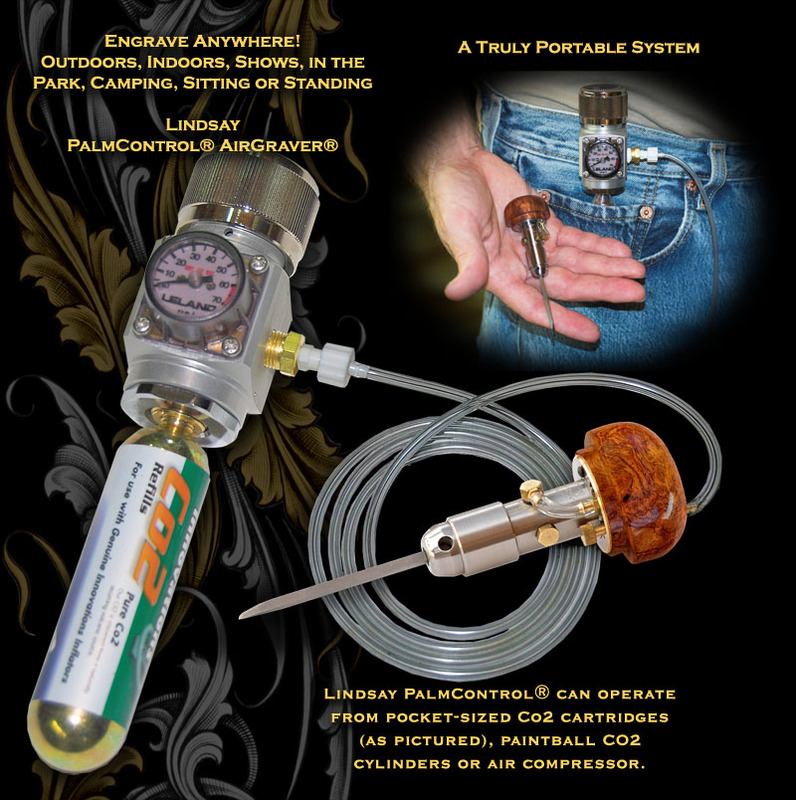 The Lindsay PalmControl® can increase the speed of learning compared to foot pedal engraving. This is because the PalmControl® is intuitive and natural in the sense that what is done with your hand is what you get. There is no need to learn to coordinate continual foot movement to every hand movement. 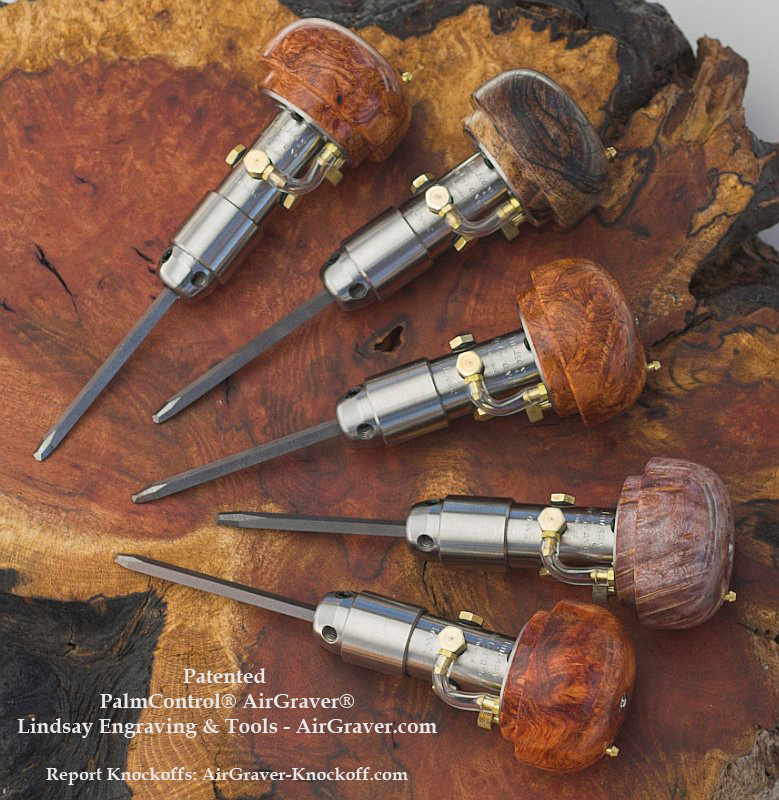 Left: PalmControl® AirGraver® is available with exhibition grade burl handle. In-progress photo showing custom made PalmControl® graver extension. “2006 CCA "Louisville Gun" Engraved by Mike Dubber. 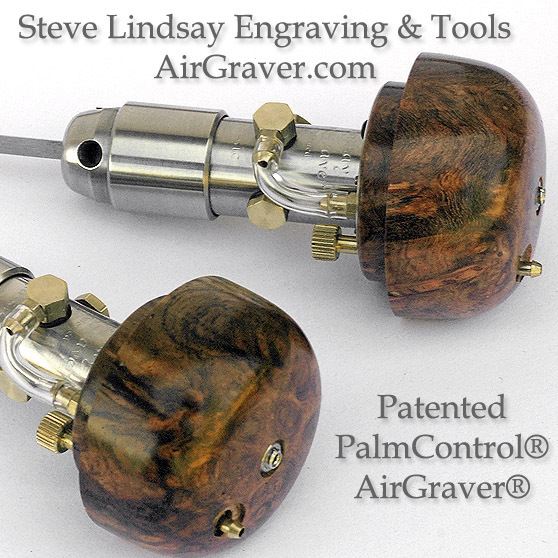 Click Here for More Feedback from Master Engravers, Jewelers and Artists that use Steve Lindsay Engraving Tools. Visit on line with other artists and jewelers using Lindsay Equipment. 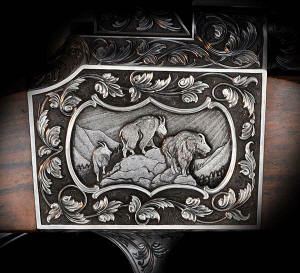 I just can't think of enough words to say my TOTAL SATISFACTION with Lindsay Engraving Equipment!!! 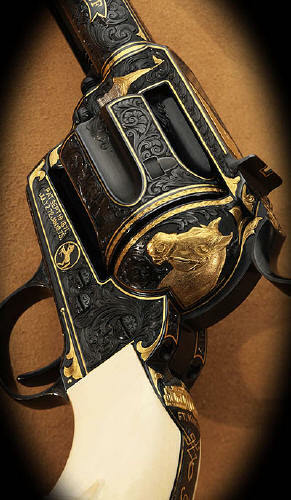 I am completely in AWE of this too!